I wonder if she has knowledge of Martial Arts? Isn’t Arya left handed as well? Now if only someone taught her how to actually use a european-style sword… The way she poses, she will pretty soon HAVE no other hand… Swordfighting isn’t karate. This is going to be awesome – I just learned they’re having an HBO show from wikipedia – This is my favorite series. I’m freakin stoked. She looks so awsome. Just like I immagined her. Arya wouldn’t have been very good right when she first started, so it makes sense for her to learn with the series. I’m sure she’ll catch on quickly. I read somewhere that Maisie is right-handed, and had to work extra hard to be credible as a left-handed fighter. I was ready for Maisie to disappoint me, but so far she’s been phenomenal. She’s the perfect Arya, and I suspect we’ll be seeing her on stage and screen for years to come. And don’t think we as fans aren’t noticing the hard work she’s been putting into her role off-screen as well. I think Miss Williams is perfect as Arya. The casting director should get a raise and his own parking spot for the outstanding job done on the entire cast… As for her fighting style… I think it’s just as it should be considering her instructor was Bravossi and the fighting style is called Water Dancing… It would be kinda… well, dumb, to have her fight in the European style… Don’t ya think??? She is an excellent actor, really brings Arya to life. Terrific show all around, she deserves a lot of credit. Arya is one of my favorite characters from the books and in the HBO series. Great job Maisie! Being left handed myself and unfortunate enough to have had a teacher who still bought into the idea that left handed people were evil and tried to force me to write with my right hand, I can tell you very well that trying to do anything with the hand that you are not dominant in is a nightmare. I developed severe headaches, and then mild seizures. Thankfully, I finally went to the school principal in tears and it turned out….she was left handed. I stopped getting smacked with rulers, but the damage was done. When they tried to teach me to write left handed, I couldn’t do it that way either. I had to take calligraphy classes for four years to finally learn how to write legibly. I can write ambidextrously now, but I’d give it all up to have just had a teacher that accepted my lefty-ness and had left me to it. This young lady in the movie is older, and most likely will not have the mental side effects that I did (as a small child your brain is still setting up his neuron network, interference at to young an age causes the problems) Being a lefty I of course always spot it when people do things left handed, I’m amazed to learn this young lady is a righty playing a lefty, I’ve gone back and watched over and over, no where do I see her screw up. Whether that is here or the continuity editors, it’s still an amazing feat and I’m most impressed. Keep up the good work young miss, I can’t wait to see what you learn next! Because Maisie is a badass. Victor P. I couldn’t agree with you more that it would have been very dumb to have her fighting European this series has nothing to do with Europe it is Westeros and she is learning from a Bravossi. Maisie is doing a fantastic job as is the whole cast! Rhiannon, that is a very sad story about your trauma. But would it have been as traumatic if doing one thing right-handed had been a challenge you took on yourself, and received praise for your adaptability? I don’t doubt your story for a minute; bigotry and being punished for something that wasn’t even bad could cause all kinds of permanent harm. But Miss Williams isn’t being called evil or forced into this. I’m sure she can still sign autographs with her dominant hand. She is a professional actor doing what she feels the role demands, and getting accolades for it. That sounds like the very opposite of trauma. Parabens pelo excelente que faz como a Arya de Crônicas e Gelo. i pictured arya somewhat differently, but she has done a truly amazing job in her role i commend her. Since you all know Maisie personally I just wanted to say that she has done a phenomenal job portraying Arya. She’s been so charismatic and professional – from using her left hand without being prompted to do so, to having her hair cut short for season 2. I look forward to seeing more of her in this role (Arya has been one of my favourite characters for more than 10 years now), and I hope she gets even more recognition for her acting chops. 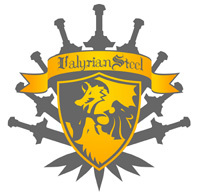 Just a question about “Needle” by Valyrian, is this going to be the official reproduction for the TV series as it’s based more on the description from the books and is different to the sword that Maisie/Arya actually has in the TV series. I know it comes with a certificate signed by George R.R. Martin, am wondering if they or someone else are planning on one that matches the TV sword? Our current Needle is a book replica designed by GRRM. We may do the show replica one day (though, GRRM doesn’t like it), but not any day soon. I cannot believe there are all these comments about right/left-handed sword fighting, and not a single Princess Bride reference. To Bob: The Dread Pirate Roberts who retired before Westley was Syrio Forel: He went on to become Arya’s teacher. Didn’t you know that??!?! @bob lol amazing, well remembered Can’t wait for my ‘Needle’ to arrive, loved Season 2, can’t wait for 3, very faithful to the books, but enough difference to still make the books worth reading without any difference to the storyline if that makes sense. But Maisie Williams was a superb choice by casting for Arya Stark, must admit the whole show has been excellently cast and produced, HBO really know their stuff. And impressive that she chose to fight left-handed, I can’t even write left-handed so fair play to her. As others have mentioned, Arya is hands-down my favorite character in the books. I know they deviated from the book somewhat in the interest of time for the TV show, but I would have loved for them to portray the “Weasel Soup” incident from the book in the taking of Harrenhal rather than Arya, Gendry, and Hot Pie just slipping out an unguarded gate in the dead of night (pun intended). That being said, although Arya was never Tywin’s Cup Girl in the books, I found the dialog when the two of them were on screen to be some of the best, most compelling video I have ever seen. Amazing! Arya (and especially Maisie) rocks! All of the kids in Game of Thrones are terrific young actors/actresses, in fact the entire cast be it Robert, Cersie, Jon Snow is completely awesome. Maisie Williams to me is the perfect translation of Arya from the books to the screen. Fabulous young actress onscreen….offscreen a great personality and excellent salesperson for the HBO series whenever she opens her mouth. A bright future awaits. I’m 15 and read all the books and have been watching some of the show and I have to Maisie is awesome! I know how hard it is to learn how to use your non-dominant hand especially without being asked to so I am thoroughly impressed. Keep being awesome I’m happy to have you as Arya! An adorable actress, a cute girl, as determined and talented anyone could wish for. Mr Martin, VS team, I have to compliment you on that very nice piece of craftsmanship! Jenny Regarding Rhiannons story, No having one hand tied down and being forced to use the other is extremely traumatic, it is impossible to describe how much worse it is than simply being ambidextrous, if as a child she chose to work with her right hand it would have been fine, she would not have had headaches and mild seizures nor would she have suffered the emotional trauma and the physical trauma to her neuro networks as they tried to re-wire for right hand dominance, thats why she got headaches, her brain was literally screaming NO!! and thats why she had to spend so long just learning how to write. they turned her from left handed to basically no handed, I bet she has trouble with hand eye coordination like catching things to this day . kids forced to use there right hand when they are left handed can develop all sorts of problems, from headaches, and seizures like she did, all the way to severe emotional and social disorders. forcing a child to use there non dominant hand and punishing them for wanting to use the other causes all sorts of problems. it was common practice to tie a kids left hand to there chair to “fix” them, the damage it does is well documented. The only good thing is its no longer done in most countries. I am fully ambidextrous I do things like bat, and golf left handed while I write,throw, and catch right handed. Luckily I grew up in a time where they no longer forced a kid to be right handed, and I had a mother who was left handed but spanked and smacked with rulers if she moved her left hand that was tied to a chair when she was writing in school, so when I did do things “backwards” it was encouraged to try things both ways and see what was more comfortable for me, like baseball, I hit much better left handed but was a much better pitcher right handed, I can write with both hands but its just more comfortable to use my right hand, it feels more natural that way. Being left handed myself, I know how hard it is to learn how to do things from non lefties. As well as how hard it is for them to try to teach a lefty when they really attempt to. Unlike Rhiannon, I was lucky that my Grandpa, who was forced to learn everything right handed like she was went to the school when I got into kindergarten and kindly informed them they would have to deal with him if he found out they were trying change his grandson. I have found that there are several things I can do ambidextrous, as well as some that I do better right handed. I have also taken fencing and yes it does throw off your opponents greatly when you are fencing left handed. So even though I could do it right handed, I used the advantage of throwing them off balance by being a lefty. I also study Japanese swordsmanship as well. Also wanted to say, that I think young Maisie is doing a wonderful job portraying Arya. I think the show version of “Needle” looks a little more rapier like with the additions they did to the hilt. Personally, I like the looks of this one slightly more. Masie is a total badass, much like Arya in the books. She acts he’s really well: powerful yet vulnerable, fearless but sometimes too eager. You guys that know Masie, tell her she’s awesome! Someone in the comments above mentioned swordplay and martial arts either don’t mix or are somehow not related. These folks keep these arts alive and well here in Alexandria, VA — see for yourself. I encourage you to stop by Midieval Madness sometime for some live swordplay, and a great authentic meal. Wonderful comments, I’m impressed with all these fans. I started watching Game of Thrones via Netflix. Arya is one of several favorites for me, and Masie is just fantastic. I’m looking forward to season 5 coming out this March so I can get caught up.